We build thoughtful and enriching student spaces. University Housing Solutions focuses on your specific student housing needs and customize each project to fulfill them. Under one roof, we have all the expertise needed to turn your vision into a reality. Current and completed projects that form the financial and logistical framework of University Housing Solutions. Recent descriptions of University Housing Solutions, including current news, press releases, and awards.. 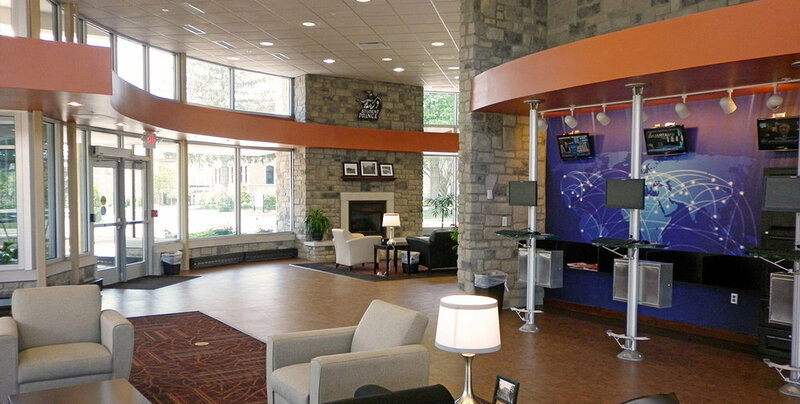 In 2014 Cleary University commissioned UHS to develop new student apartments on the Livingston Campus in Howell, Michigan. The resulting design features one new building with a total of 84 new student beds in a mix of four and six bedroom apartment style units. The site is master planed for an additional 84 bed building at some point in the future. 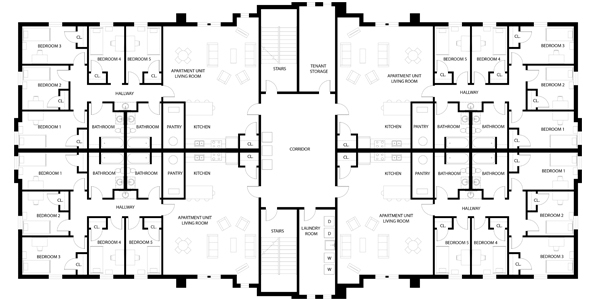 Each floor features seven suites including the RA suite on the first floor. With the exception of the RA suite, the suites have two semi-private bedrooms - each having a restroom and each suite also has a full kitchen and open living area. The second and third floors feature a student lounge and the first floor has a lobby with a front reception desk and a study room. In 2018 UHS completed Phase II of the project, which is a an organization of 2-bedroom units. Phase II mirrors the existing residence, creating a student commons courtyard and quad for outdoor activities. 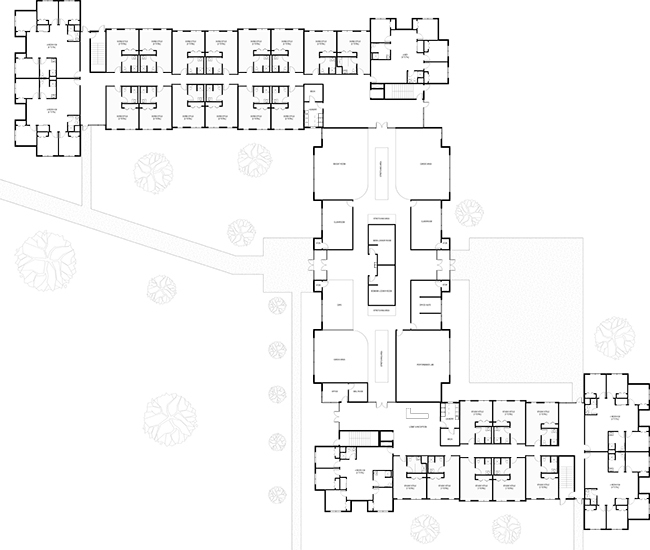 There is future potential to connect these residence halls with the creation of a dining facility. The primary housing unit is a double occupancy dorm-style unit with two separate beds and work-spaces. Rooms include two separate closet spaces. Two rooms are paired together and share a kitchenette and restroom between the two. Phase II is designed to match architectural characteristics of Phase I, while completing a new student exterior space between both buildings. Together this composition of buildings creates a new student housing hub that will serve the campus for years to come. For the first time in 45 years, Heidelberg students have new “digs” to call home. The new facility is a 120-student residence hall and a 9,000 sq. ft. student commons area for all students. Aimed primarily at sophomores, the hall includes five, two-story, 24-student “pods,” each with 12 students per floor in bedrooms surrounding an open, two-story living/gathering space. The living space includes a balcony, loft seating, kitchen, soft seating and study spaces to reinforce the academic mission. An important part of the project is the student commons area, which features a cafe pub, great room, study spaces, meeting and conference rooms, along with a patio for outdoor dining and social gatherings. 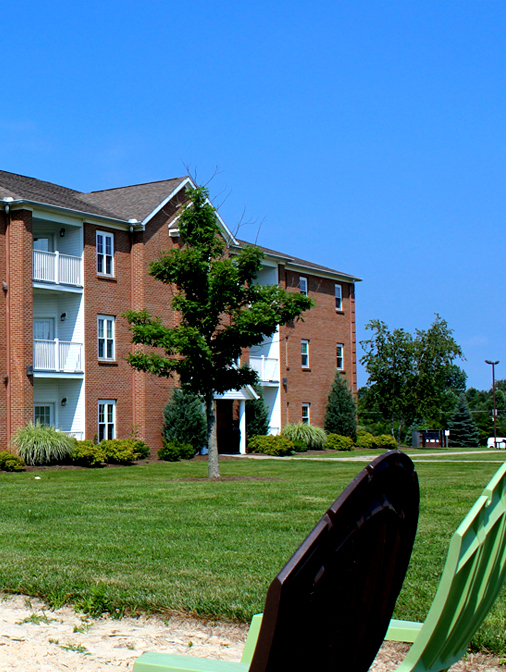 Students from The Ohio State University and the North Central State College Regional Campus in Mansfield, Ohio share accommodation at Buckeye Village Apartments. The project is situated on land adjacent to the campus that the schools currently share. The new residence village is planned in phases, with the first phase having opened in 2014 and phase II opening in 2016. A third phase is planned for the future if enrollment supports it. Phase I and II featured three 38,000 sq. ft., 84 student buildings comprised of 3 and 4 bedroom housing pods. Each pod features a kitchen and dining area, a living area, and a utility area for a washer and dryer. Each bedroom has its own restroom and closet. Building I in the first phase also features a clubhouse equipped with a wireless cafe, group study areas, and a computer lab. The room can also be used for social events. 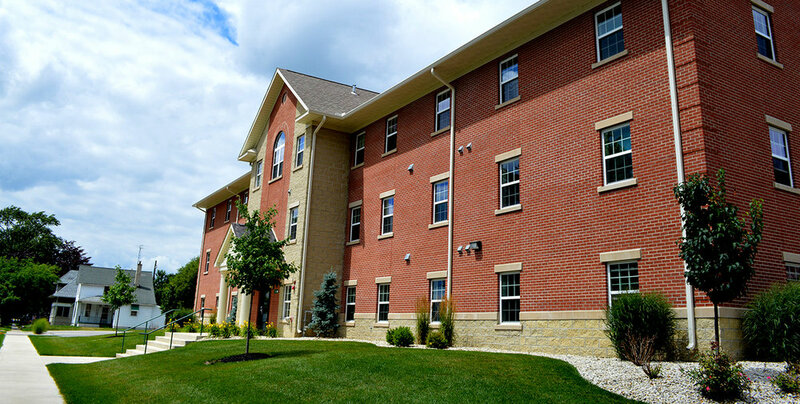 In 2008 Tiffin University contracted UHS to design and develop a new student housing complex on recently acquired property in close proximity to the university. The eight acre site was a former junk yard, contaminated and listed as an environmental hazard by the EPA. UHS, with the help of our environmental consultant, remediated the site and developed a new 220 bed living-learning community adjacent to Tiffin University’s proposed new athletic center. The project was planned in several phases with Phase I including the development of the entire site and the first two buildings. Each apartment unit is equipped with a full kitchen, living/dining room, two bathrooms, and five single bedrooms. Central State University commissioned UHS to develop a new student housing complex. The site of the proposed development is the old Wilberforce Campus and will accommodate four 100-bed buildings along with parking for 200+ cars, and a new dining facility, while also providing ample campus green around the residential spaces. Each building is designed to complement the adjacent historic Emory Hall and provides large informal commons areas on all floors along with computer labs and quiet study spaces. 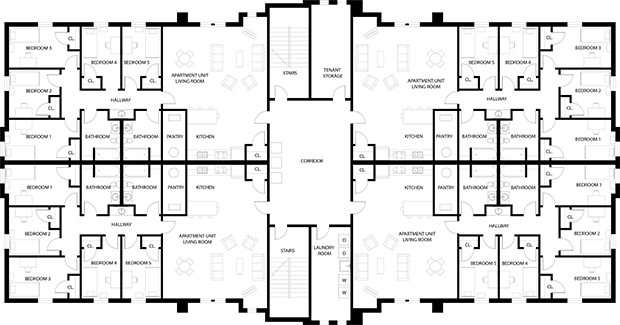 Each 100-bed building features 36 semi-private rooms and 24 private rooms, two RA Suites and a single two bedroom suite. Each suite provides two private bedrooms and two semi-private bedrooms with three private baths. The Ashland University College of Nursing project began as a master plan for a new school of nursing on an 18 acre greenfield site. The final master plan consisted of three new residence halls at 21,000 sq. ft. each. Each new residence hall is a three story structure housing four apartment suites per floor, with each building accommodating 60 students. The project was developed by UHS and was a complete design-build-lease back. UHS will gift the buildings at the term of the lease. 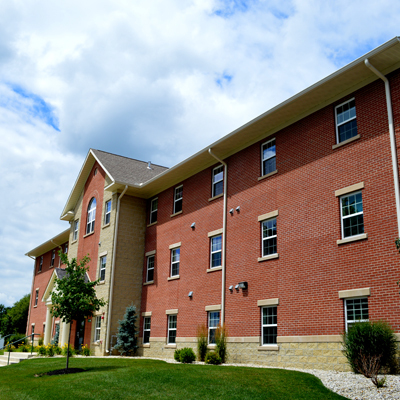 All three residence halls are complete; however, the academic building is now on hold. The proposed living learning community at Florida Memorial University draws inspiration from the roots of FMU’s history of self reliance in which students constructed many of the buildings themselves. The design is a series of solid building blocks that together form a united whole. It is a representation of the coming together that occurs when student’s undergo an educational journey - each person fully necessary for achieving a greater goal. Embodied most readily by the Farmstead - Terra State Community College is a school where one not only finds their place, but also from which to grow. As such, the design of Terra Village is intended to represent the richness and heritage of this inherent progression with its use of the site through architecture to create a place for students to live, learn, and grow. The proposed building massing & organization embodies the design of a refined industrial silo aesthetic. The primary massing stems from three main silos - two at each pivot point and the third facing campus - which serve to anchor the building within the site while connecting with the existing vernacular. While large, the building is separated into three masses, and a pass-thru is provided to allow an uninterrupted connection with parking and nature trails from campus. Retail is provided on the ground floor while the administration portion of the program is allocated at the primary entrance. The proposed project includes room for 120 beds with the development of two separate three-story buildings. The design calls for each building to have 12 suites that can house five students in private bedrooms. Also included on the 1st floor would be a one bedroom apartment designated for an area coordinator. 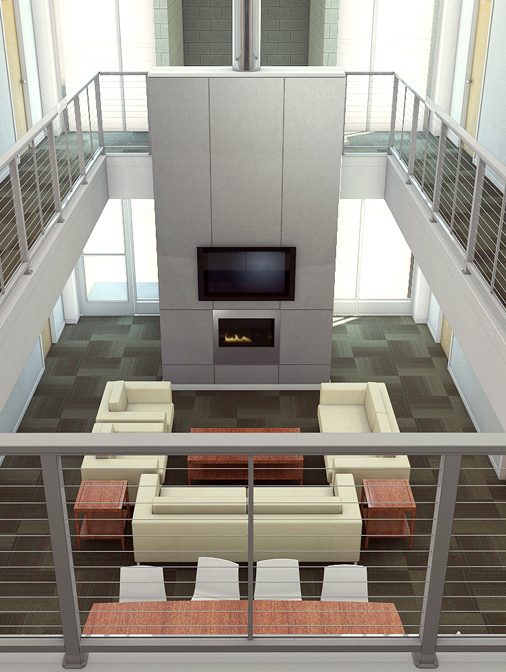 The student’s suites will have all the amenities that the modern day student population is requesting. Each floor will have common living/lounge spaces designed to increase interaction among the students. There will be common laundry areas designated for the students, also space available for various club meetings, study rooms, or recreation space. The completed building is defined with a pitched roof, while utilizing clean edges and standing seam materials to keep with the intended modern feel. The design of the Student Housing & Wellness Center is centered around the concept of legacy // distinction. Embodied most readily by the notion of enduring significance - Central State University is a university where one not only finds their place, but also from which to expand beyond. As such, the design of the Student Housing & Wellness Center is intended to represent the richness and heritage of this inherent progression with its use of the site through architecture to create a place for students to live, learn, and grow. Resulting from the site’s location adjacent to athletic facilities, this site is appropriate for a student housing and Wellness Center. It is accessible by most parts of campus, and would create an anchor and public face on the east part of campus, making it the prime location for student housing. 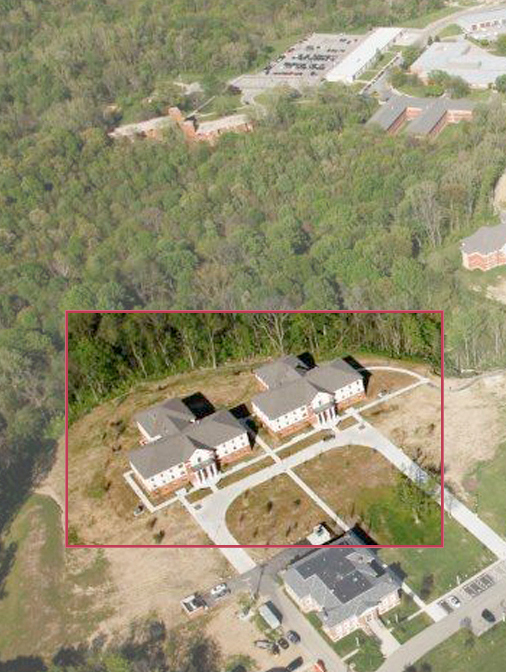 Phase II of the new residential area is a two-story hybrid-style organization located on the northern edge of campus. Because of its proximity to the main entrance, the building takes into consideration views into and out of the units with the use of vertical architectural elements. Directly south of the new residence hall is a a new student outdoor space, similar to a quad, adjacent to the lake and trees for students to gather and interact. The buildings linear alignment creates a datum between two environments. While the entry side creates a new urban face, the rear is embedded in the natural beauty of the campus, Running along the entry drive, the dorms are directly across from Belmont’s ballfields, encouraging students to watch a game and participate in the greater campus community. The service spaces of each pod (the restrooms and the stair cores) are pulled away from the dormitories ensuring privacy and security. The stair cores and restrooms are grouped into a service-oriented bar distinct from the main community space. Light flows between the two bars and separates these very different uses. The proposed design of the living learning center embodies a contemporary take on existing campus vernacular and creates a social hub for student residents. The form derives from basilica typology - a large, open, centralized nave and gabled roof - which becomes a community space for residents. Materials and massing stem from the newly constructed campus chapel - extensive brick walls, tall expanses of glass, and a standing seam metal roof. Phase I provides three levels of student housing featuring 93 total student beds. The rooms range from one to two-bedroom units located on each wing of the building. With a spacious area situated between the two glass facades, students are provided a common area where they can gather, study, and interact with peers. The vertical protrusions and horizontal overhang at each curtain wall are designed for daylighting - allowing the winter sun to enter into the building but shielding the summer heat. St. Thomas More University Parish recently commissioned UHS to develop a new faith based, formative and international student housing community for St. Thomas More Parish in Bowling Green, Ohio. While still in the early design stages, the proposed project is a new 107 bed, four story residence hall as an attached addition to the existing Newman Center. The main entry of the new community hall will contain a large gathering space for students and parishioners to informally interact. Part of the first floor, as well as the upper three floors, are designed around the household concept. This concept encourages the members of the household to not only live together but to eat, pray, and study together. Each student has a private bedroom, and there are six bathrooms for each household. Each household has its own kitchen area, dining, study area and laundry area. UHS participated in the preliminary planning stages of development of a four building quadrangle centered student housing project for Franciscan University. 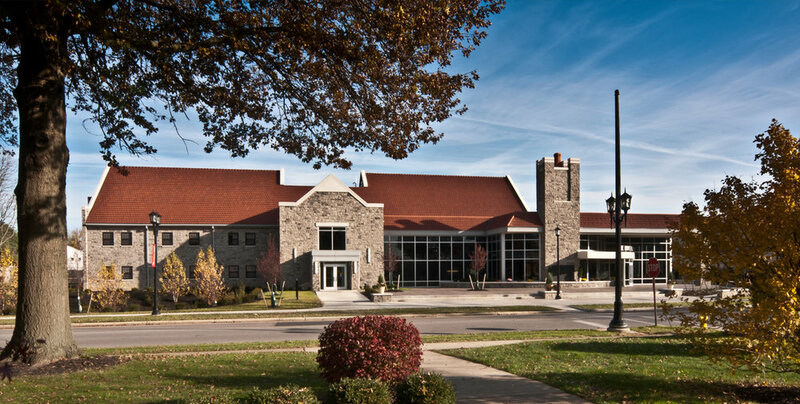 The uniqueness of this project is that each 55 student building is connected to a chapel that connects the commons of two buildings. The site is situated directly adjacent to the university and was previously a municipal golf course for the City of Steubenville, Ohio. The new apartment style housing project will give incoming students more choices as to the types of housing accommodations.